Research South specialises in the history of the southern and eastern parts of Auckland city (Howick, Manukau, Manurewa-Papakura and Franklin wards), but also has strong general reference, family history, Māori and New Zealand collections. ​The heritage collections include a wide range of books and periodicals relating to the history of South Auckland, as well as historical South Auckland newspapers, photographs, maps, oral history recordings, ephemera, and manuscripts and archives. The extensive New Zealand family history resources include the Births, Deaths and Marriages indexes on microfiche, the New Zealand Herald on microfilm from 1863 onwards, and the New Zealand Gazette database. 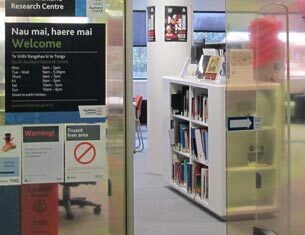 The Te Wāhi Rangahau Māori collection brings together a wide range of books, periodicals and other resources on Māori-related topics. Māori Land Court minute books are held on microfilm from 1865 to 1975.